What the players and coaches are focused on is how to stop a red-hot Rams team that has bulldozed the competition in their first two games this season. The Chargers are going to have their hands full this Sunday against the Rams because their defense is no joke. The Rams have outscored their opponents 57-0, picked off the opposing quarterback four times, and haven’t allowed a single touchdown all in the last six quarters. As we all know, games are won and lost in the trenches and the Rams have one of the best interior defensive linemen in the NFL in Aaron Donald, and he’s flanked by Ndamukong Suh, and Michael Brockers. All three have been dominant at the beginning of the season and the Chargers have taken notice. “It is somewhat different because most weeks — it's a big-named edge rusher it seems like every week, but obviously these inside guys get a ton of attention. Not to take away from the outside guys, but rightfully so those inside guys get most of the attention. They're really solid players. 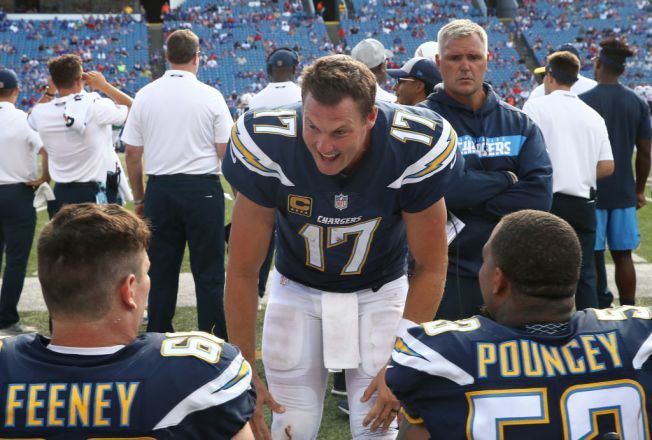 It's a heck of a challenge,” explained quarterback Philip Rivers. One player that could have some insight on one of the Rams interior players is center Mike Pouncey. He played with Suh for three seasons in Miami and knows what it is like to be out there on a hot day going up against a bull like Suh. One thing the team will have to work on is not getting complacent. Last weekend against the Bills, the Chargers went into halftime up 28-6 but ended up only scoring three points in the second half, and against a team like the Rams you have to continue applying pressure. “It really came down to we didn't get going. We had opportunities and we missed a play here or a play there. It seemed like [there] was one in every one of those series. I think it was three series in a row where we didn't get going. If we just made one of those plays, if we had stayed on the block a half-second longer, if we had used the correct technique, then I think we would have been back in that mode of the way we were playing in the first half,” explained offensive coordinator Ken Whisenhunt. “If’s” won’t cut it this weekend against a team that plays “knock you out” football. When they sense the opposing team is about done they go for the final blow. So, if the Bolts have any chance of winning this game they will have to go blow for blow with the Rams. They may be in the same city, but the only thing they are both fighting for is another win in a long season. •Chargers injury report: defensive end Joey Bosa (foot), right tackle Joe Barksdale (knee), fullback Derek Watt (thumb), tight end Antonio Gates (illness) did not practice. Receiver Travis Benjamin (foot) was limited in practice and running back Melvin Gordon (neck) was a full participant. •The Chargers worked out defensive end Kony Ealy. Coach Lynn downplayed the situation and said he has full confidence in Isaac Rochell starting in place for Bosa. He said they worked him out just in case they need a player in the future they know they are ready to play and are in shape.